Artefacts from a 17th Century shipwreck found off the Dorset coast have gone on display. Students and experts from Bournemouth University have worked for two years on the wreck site, in an area off Poole Harbour known as the Swash Channel. 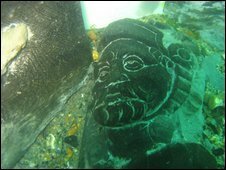 The ship, which lies about 23ft (7m) under the sea, is thought to date from the 1620s. Its country of origin is unknown. The university is holding a Maritime Archaeological Day on Saturday. Paola Palma and Dave Parham, the university's maritime archaeology experts, are speaking about their experiences of working on the wreck site. Artefacts raised from the seabed and on display include two leather shoes, musket balls, kitchen utensils and an apothecary jar.